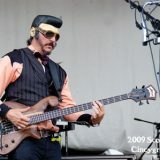 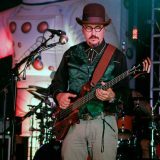 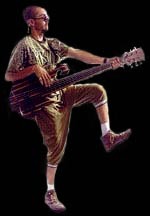 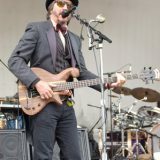 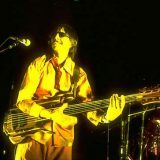 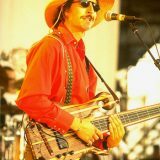 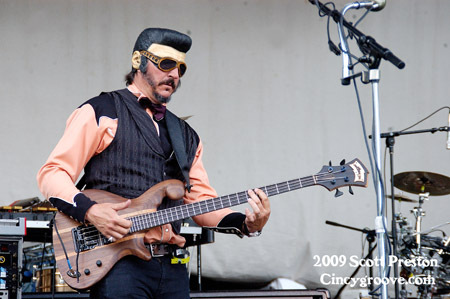 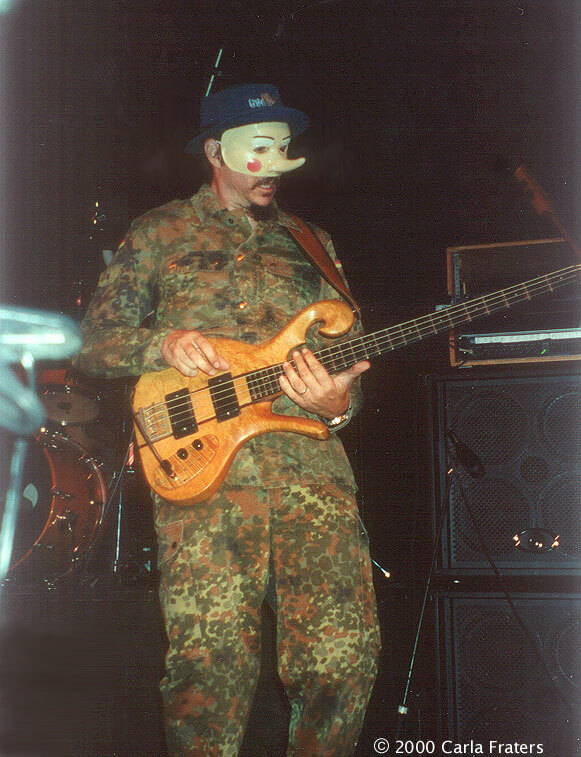 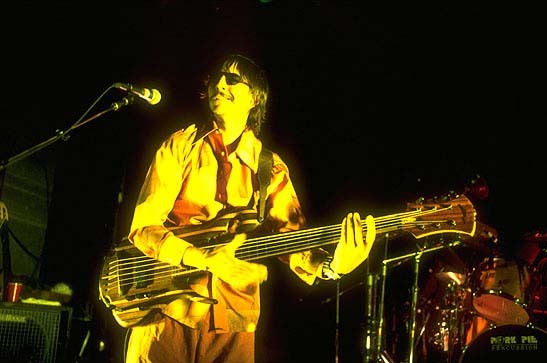 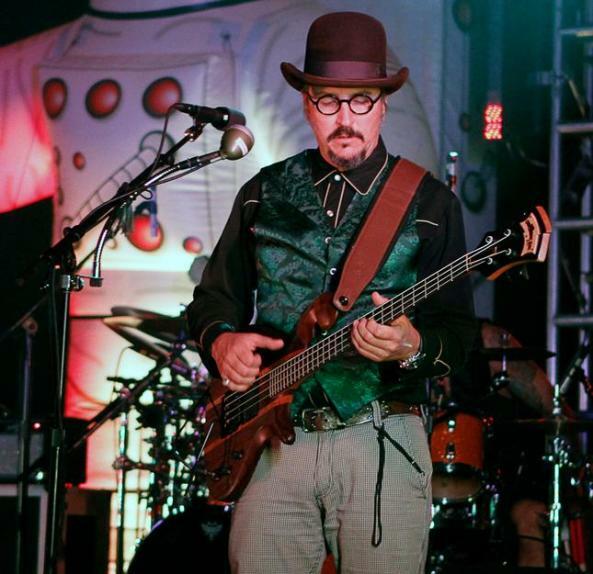 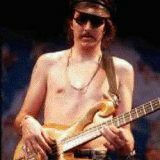 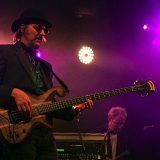 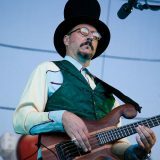 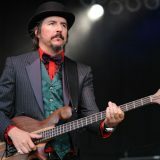 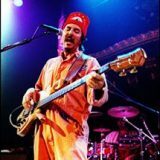 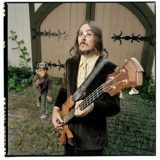 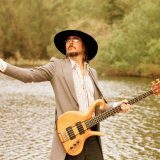 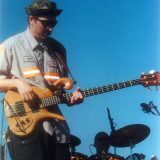 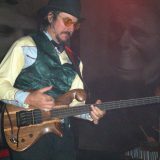 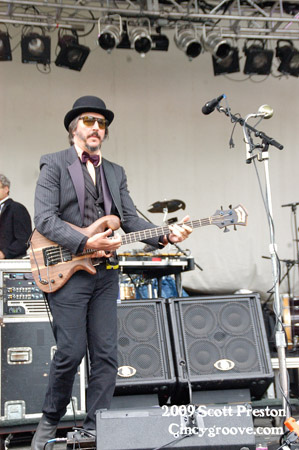 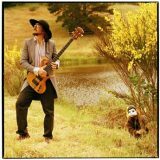 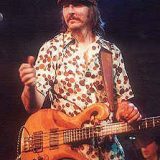 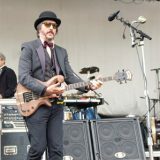 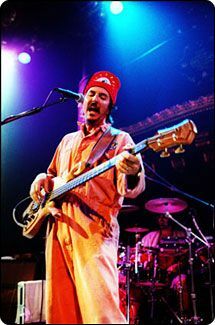 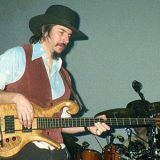 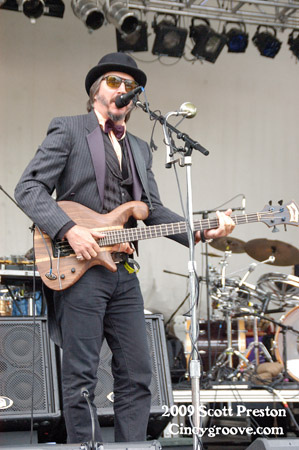 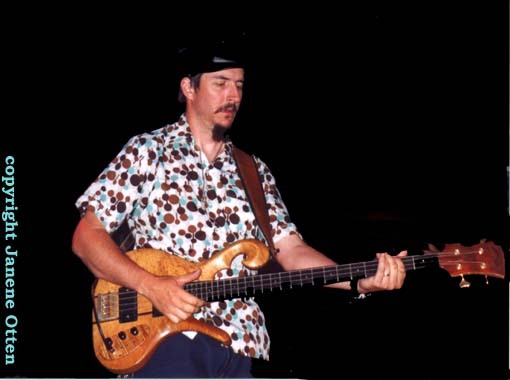 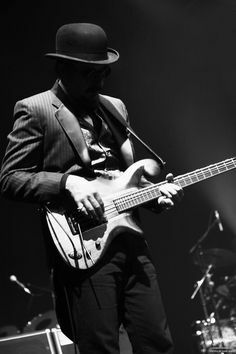 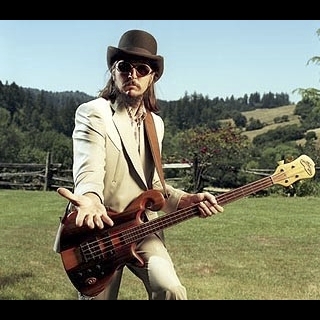 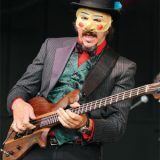 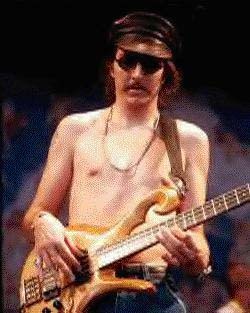 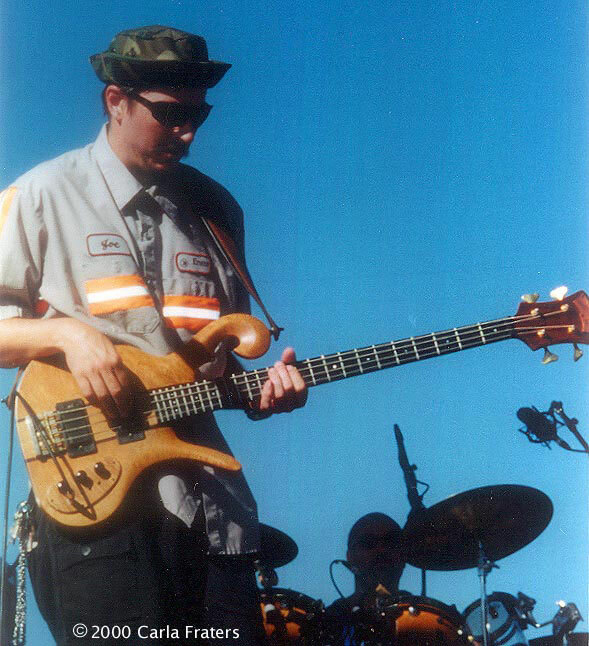 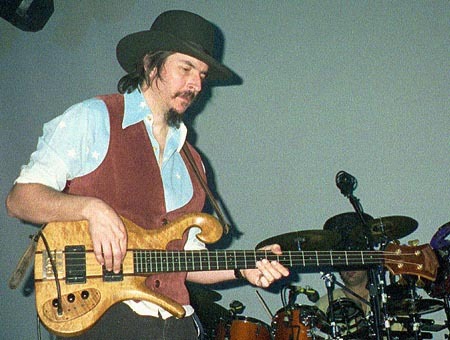 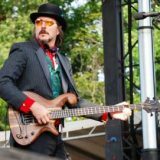 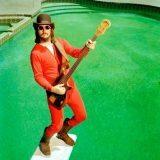 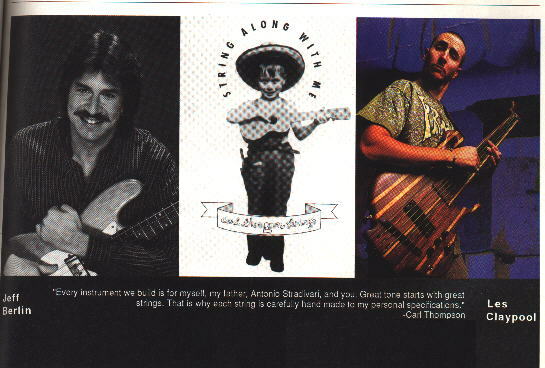 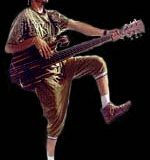 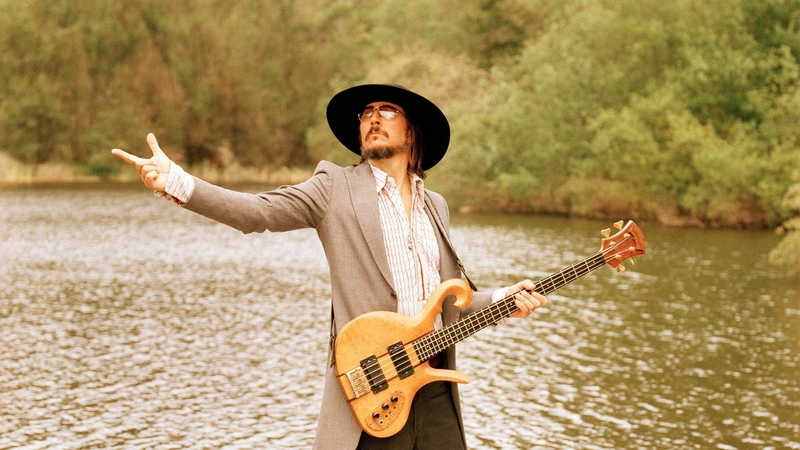 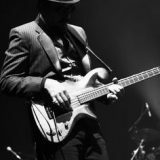 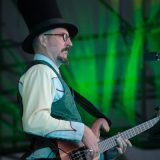 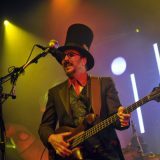 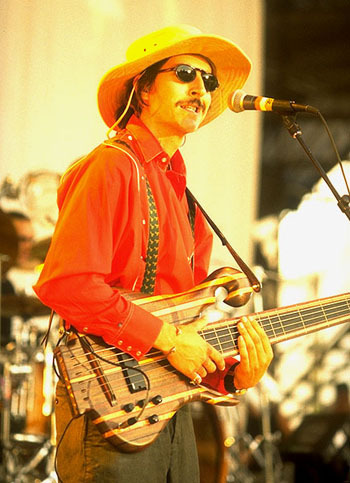 Les Claypool owns seven Carl Thompson basses. 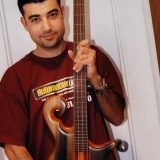 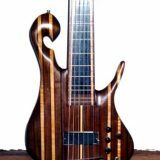 The first is a 4 string fretted 32″ scale piccolo bass made of walnut and mahogany, and fitted with a single EMG-35DC pickup. 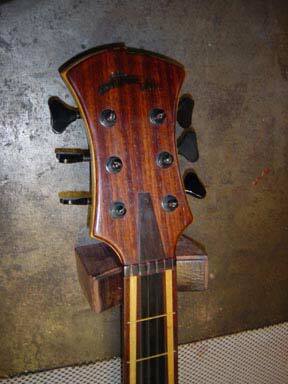 It has a Kahler tremelo that was later added by Claypool. 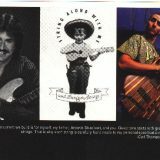 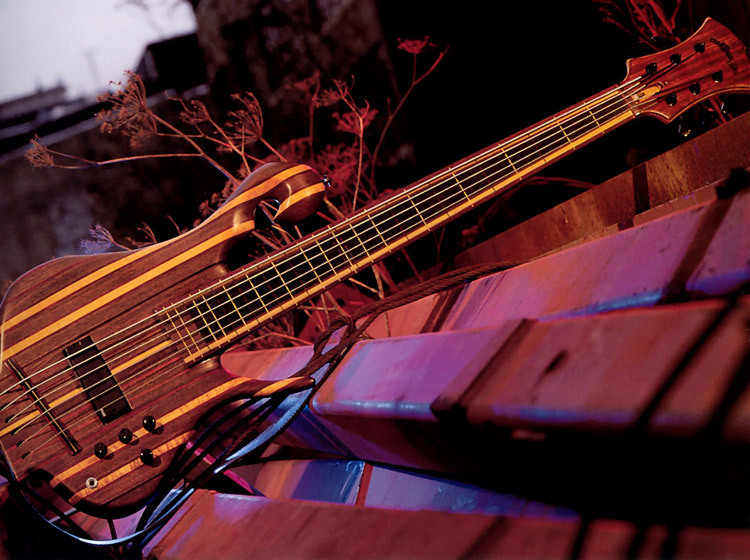 When Les was a teenager, he saw the bass in a music shop in his home town. 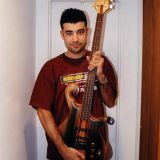 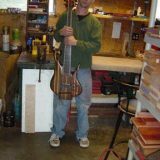 His first thought was that it was the ugliest bass he had ever seen – then he tested it out with playing “Roundabout”, and as it turns out, it was the most comfortable bass he had ever played. 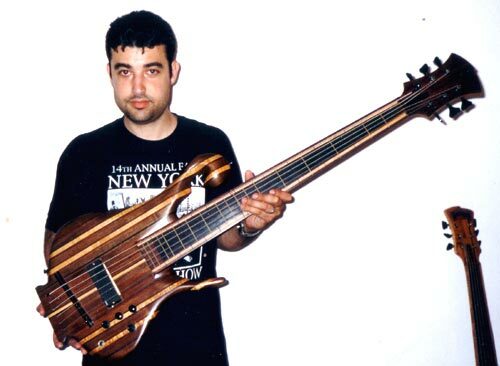 He begged his parents for some money and he bought it the next day. 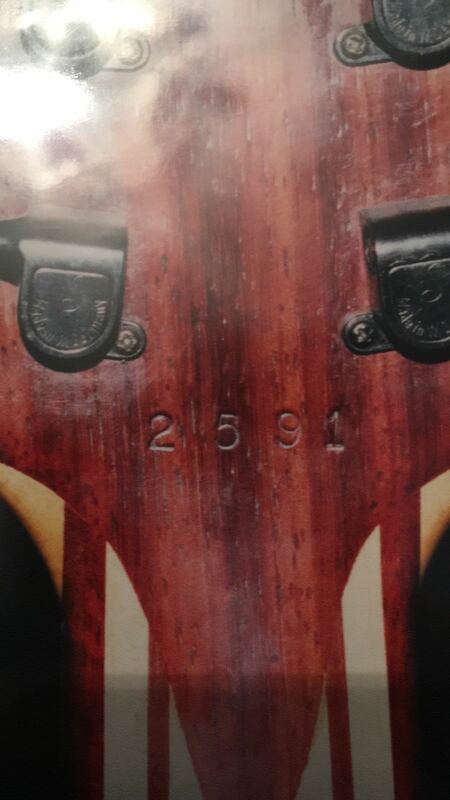 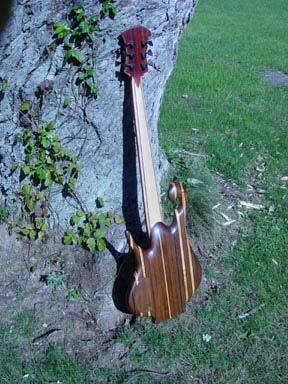 New to this bass is a small piece of flamed maple on the headstock that is signed by Geddy Lee, pictured here. 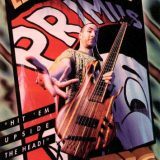 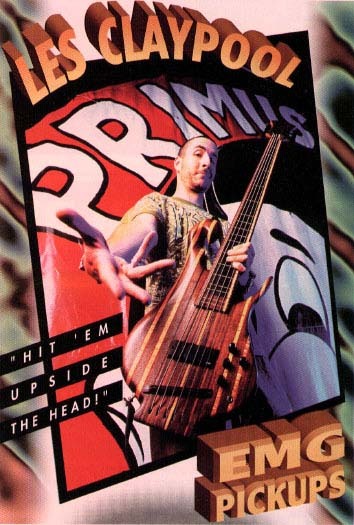 You can also see it in the Primus Home Video, “Videoplasty”. 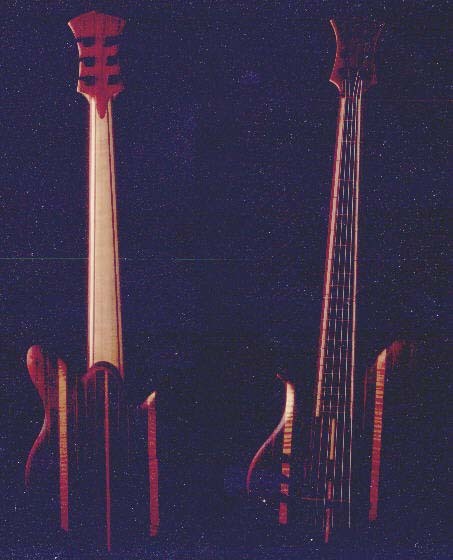 The second bass is a 4 string fretted Maple body bass used as a backup for the first. 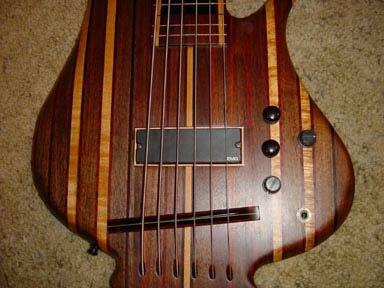 It has two EMG’s rather than one, and lacks the tremelo of the main bass. 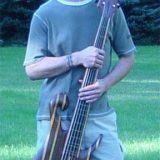 The third Carl Thompson bass is a 6 string fretted, birds eye maple bass with a cherry neck and ebony fingerboard. 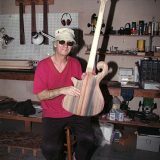 It was actually the first 6 string fretless bass ever created, completed in early 1977 for Chris Brubeck, Dave Brubeck’s son. 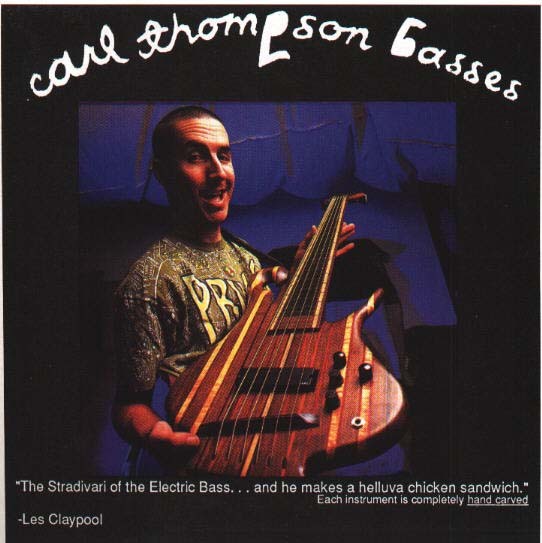 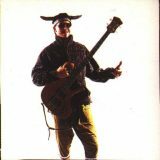 Carl later put frets on it and sold it to Les just before Pork Soda was recorded. 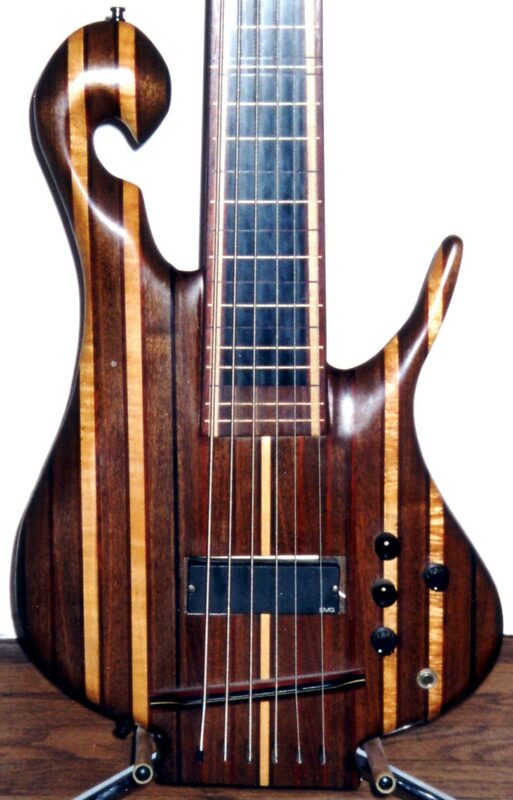 Carl never really liked it because of it’s thin neck, but Les loved it, especially with lighter gauge strings. 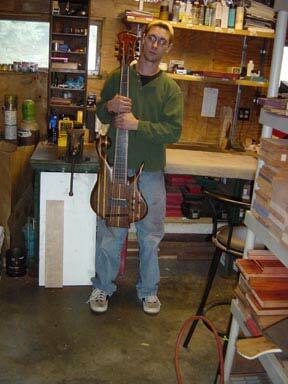 It had been sitting in Carl’s closet for years. 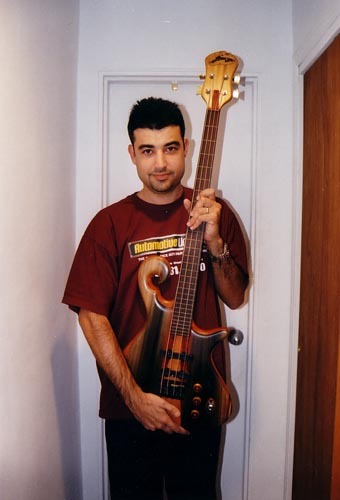 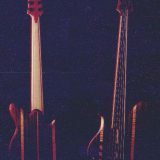 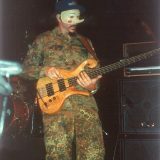 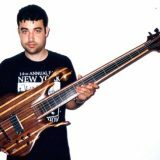 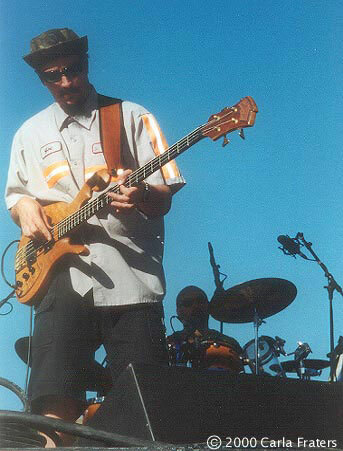 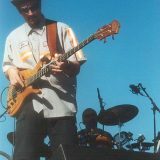 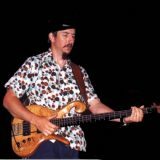 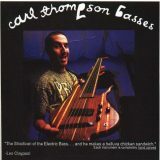 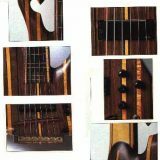 The fourth, and most infamous Carl Thompson bass Les owns, is a 6 string fretless multi wood bass. 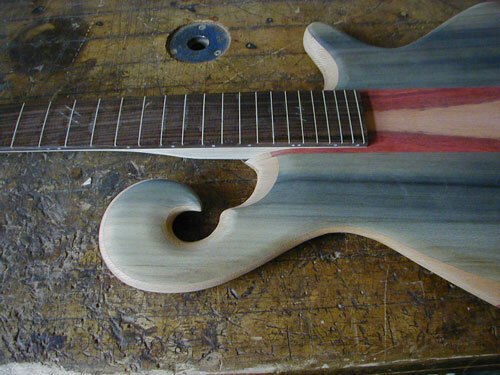 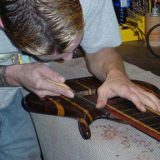 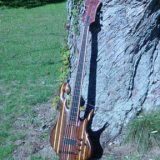 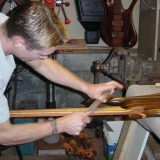 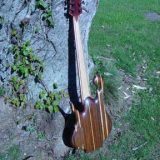 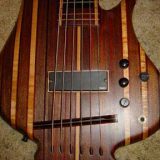 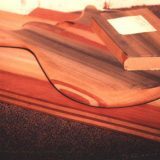 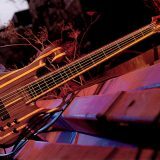 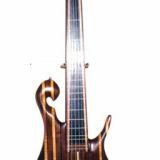 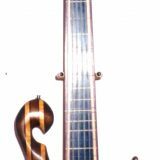 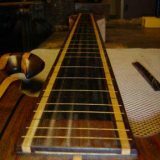 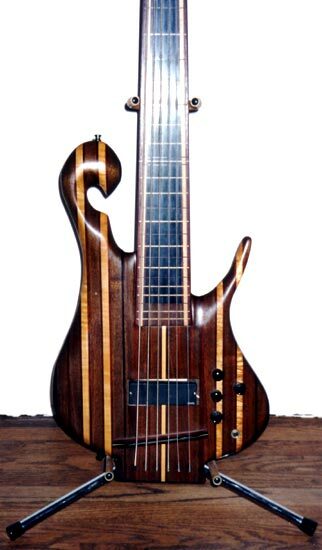 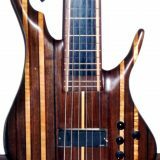 It is nicknamed the “Rainbow Bass” because it has strips of walnut, curly maple, padauk, purple heart, ebony and cocobolo. 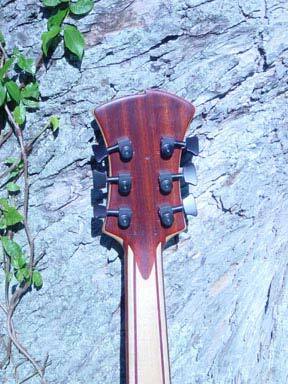 The strings are threaded through the back of the rear extension – near where the strap pin is. 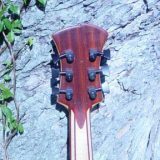 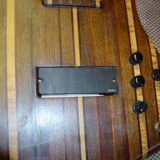 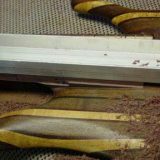 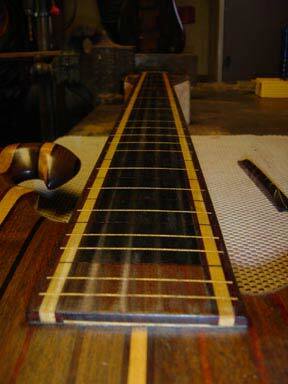 They’re stretched over a one-piece, hand-made wooden bridge and anchored by Schaller tuning machines. 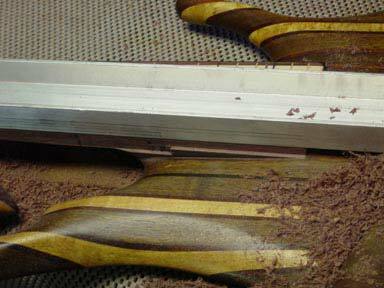 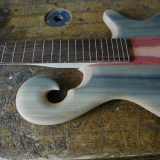 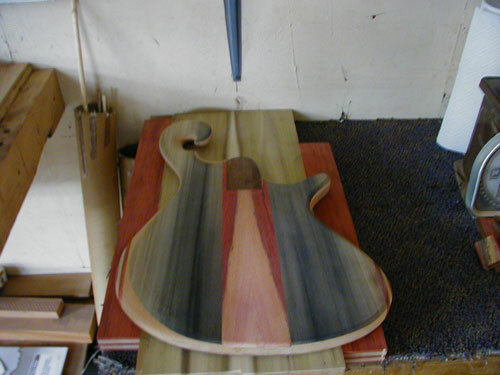 The basic part of the neck is made of quartersawn hardrock maple. 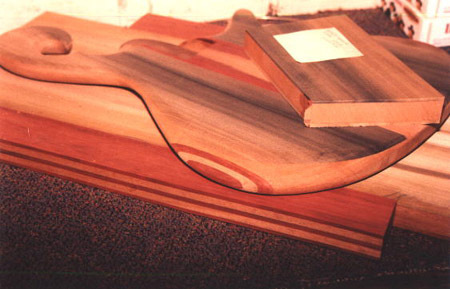 The center of the fingerboard is Indian ebony, with 1/8-inch-wide strips of padauk, cocobolo and ebony on either side. 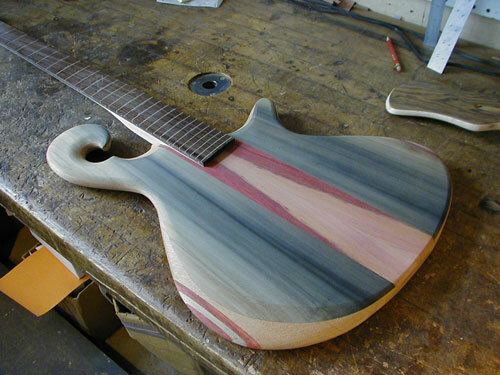 It has a single EMG-DC pickup with an EMG-BTC preamp. 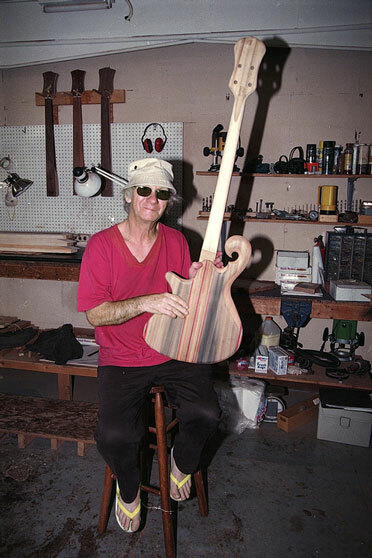 Les received the bass just in time to record “Sailing the Seas Of Cheese”. 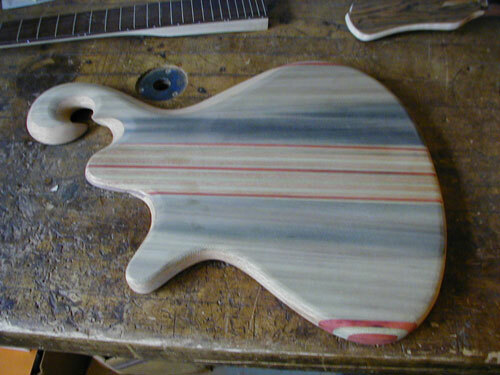 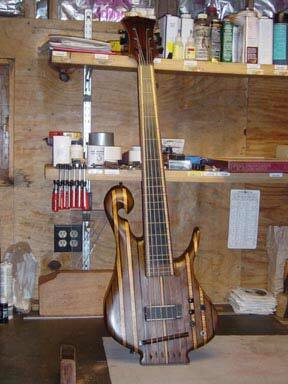 Be sure to check out the photos of the bass with a shortened upper horn. 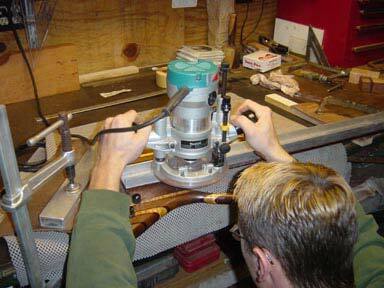 At first the balance was off, so Carl cut off the horn. 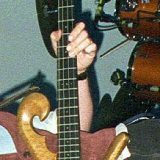 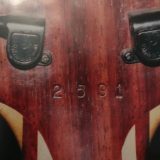 Les made the “Jerry was a Racecar Driver” video with the bass in this condition, and then later sent it back to Carl to have the entire bass rebuilt. 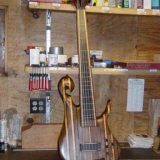 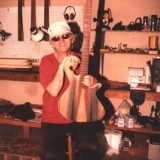 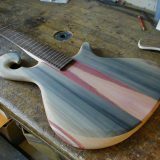 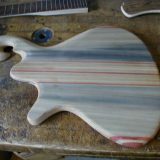 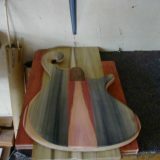 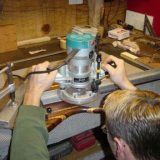 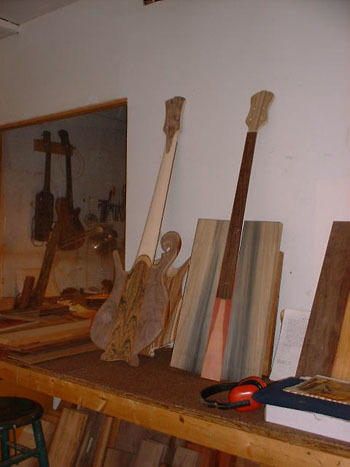 In the 2002 Les again sent the Rainbow Bass back to Carl’s shop, this time asking for a couple of modifications to be made. 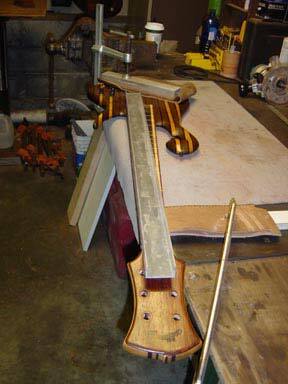 Specifically he was looking to get the neck thinned down a bit. 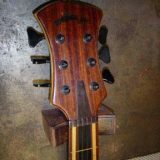 Although the neck width is the standard for Carl’s 6-strings, Les uses a tighter string spacing and therefore has a little room on either side of the neck to play with. 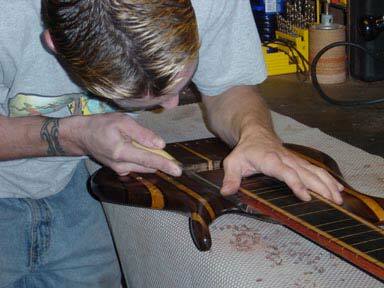 While the bass was there, Carl decided to do a couple of other small upgrades as well. 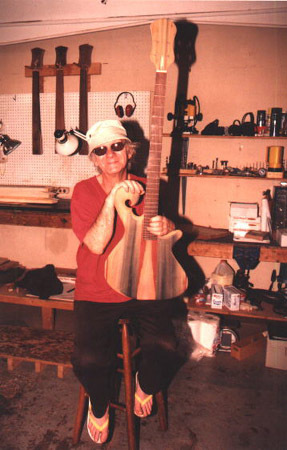 He shaved an 1/8″ off of each side of the neck and reshaped it, refit the headstock to accept Sperzel tuning machines to remove weight, framed in the pickup pocket so the pickup would fit better (the original pickup had a wooden cover on it so the uncovered pickup fit loosely), and cut a new nut so the string spacing would be correct for the new neck width. 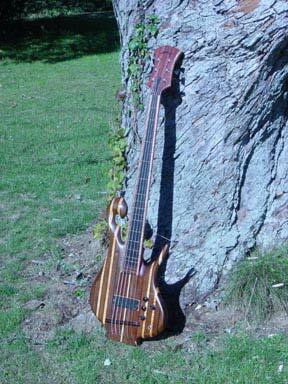 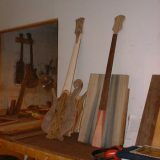 Les’ fifth bass is a 4 String fretted bolt on with a 1/8 layer of Macassar Ebony covering the whole top and headstock. 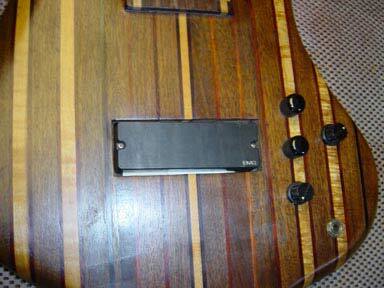 It has 24 frets, 2 pickups, is of 36″ scale, and includes a black Kahler tremelo bar. 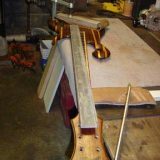 Note the re-cut lower horn in later photos. 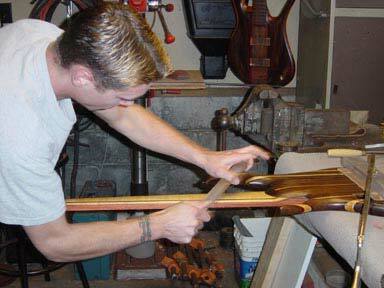 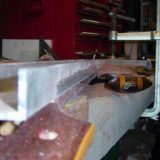 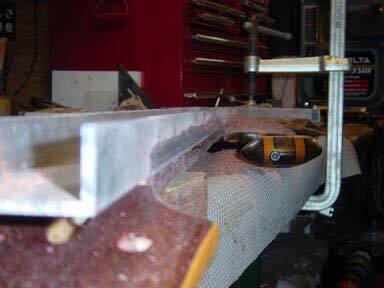 In order for Les to be able to reach the high frets, Carl re-carved some of the body after the bass was finished. 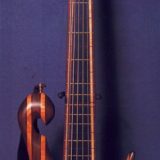 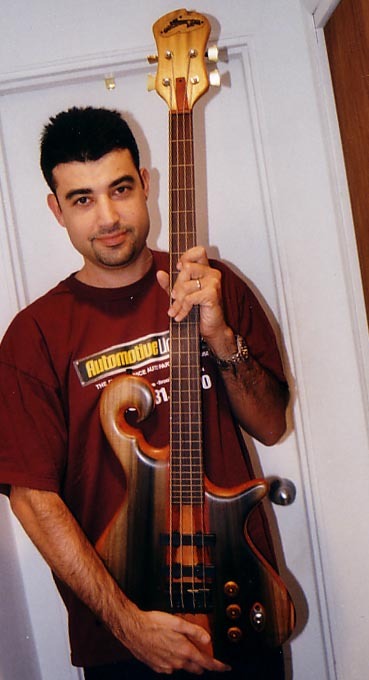 The sixth bass is a 4-string fretless piccolo with a canary wood and mineral-stained poplar body, completed in 2002. 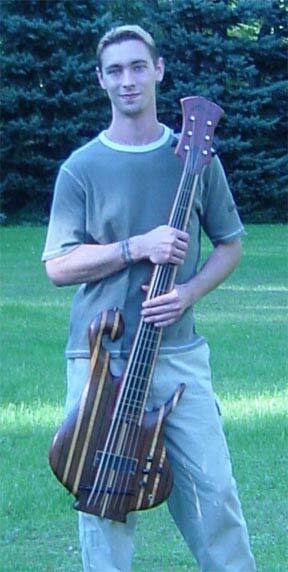 Finally, Les’ seventh Carl Thompson instrument is a replica/copy of his 1976 Walnut bass that Carl made for him in 2006. 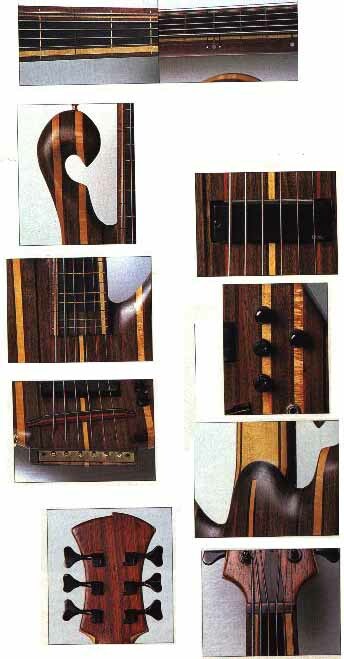 Les asked for the copy in order to semi-retire the original bass.